Tour of Saints | So Many Exciting and Beautiful Places! We arrived early this morning at St. Thomas. Our first stop was at “Magic Ice”, an ice bar down town that had been created in an old cold storage building. We donned down capes and gloves before entering the exhibit. For us Minnesotans, it was actually warmer than back home. We enjoyed several ice exhibits as well as a sample of chilled rum. I also tried out an ice slide – quite fast! After the ice bar, we did some shopping in Charlotte Amalie, then stopped at Mojo’s Rum and Surf Shack, settled into a couple of swings at the bar and sampled some more rum. After dinner, we watched a light and water show on the top deck, sort of a mini-Bellagio show. That was followed by a musical show called Fiera. The costumes and lighting were very elaborate, and the music was excellent. We reached St. Maarten/St. Martin today, an island that is split between the Dutch and the French. It is the smallest island in the world to be shared by two countries. Port is on the Dutch side (St. Maarten), where the inhabitants speak both Dutch and English. We all took a cab to the French side (St. Martin) where they speak both French and English. If you don’t see the sign, you won’t even know you are crossing the border. We did a bit of shopping and then joined Sally and Jeff for some lunch. Jan and Brian left earlier to do a stint on an America’s Cup Yacht in the afternoon. 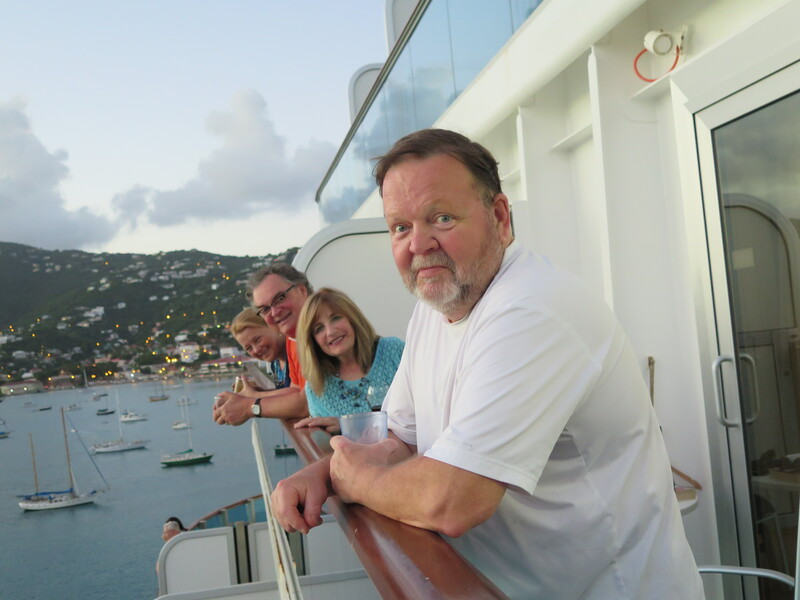 After lunch, we headed back to St. Maarten, where Sally and I did a bit more shopping, and Mark and Jeff returned to the ship for some napping. After we reached the port, as we were walking to the ship, we could see Jan and Brian lounging on their balcony. At dinner, we celebrated Sally’s birthday! She was presented with a small chocolate cake and was serenaded by the wait staff. Then Mark and I headed to a movie, which he watched while I slept. It was a long day in the sun, and I was exhausted from shopping. What a life! This entry was posted in Caribbean Travel and tagged St. Maarten, St. Martin, St. Thomas. Bookmark the permalink.